The storyline is roughly based on the Bond film genre in general rather than any one specific film, and I think it pulls it off pretty well. With a range of level types including a boat, jungle, volcano and secret base complete with space shuttle - they've covered pretty much all the usual suspects! Basically, you have to work your way through each level shooting any enemies that come across your path and collecting Q cases/rescuing hostages along the way, until you reach the (unmarked) exit. And although this sounds very basic and simple, it's not. The controls are dodgy to say the least, more of that later! 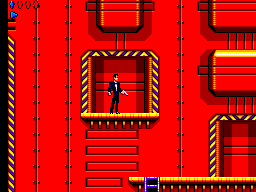 Each zone consists of 3 levels and then a boss, all of which are well known Bond villians! Apart from the last zone which doesn't have a boss. Yep you read that right, there is no final boss in this game. Instead they implemented a mad rush to escape the underground base that bond has set to self destruct, which in theory sounds good but in practise it's actually the easiest of all the levels (as long as you have enough time) so is a little bit disappointing for a last level. 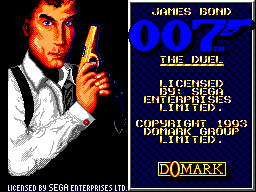 All in the game feels very Bond like throughout though, and the only thing I would have really liked to have seen implemented would be gadgets of some kind. You need to collect as many Q cases as you can throughout the game and although these give you grenades and missile launcher ammo I found myself never using either as you have to pause the game to change weapons, which means getting up - not likely!!! Graphically, I have very few gripes at all with this game. 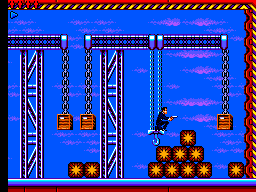 The characters in the game all move fluidly and you can recognize all the bosses straight away, although Oddjob is quite a bit too tall and looks more like the fat controller! There are some slightly dodgy choices of uniform for your run of the mill bad guys but you'll be killing them before they get on the screen properly most of the time so it doesn't really matter. There is however a few little problems. On certain levels there are blue turret guns, and quite often these guns are placed on blue backgrounds, I'm sure you can see what my problem with that is! Other than that there's just the odd graphical glitch, when Bond is standing near the crates that rise and fall for instance, but nothing too major. Very basic. There isn't a right lot to say about the music, it's catchy enough and not too annoying, but at the same time it's not very memorable, just OK. The back ground music has a very annoying habit of just stopping mid level though, especially on 3-2 - I haven't made it through that level with full music yet! Sound effects again are OK, nothing special. The gun sounds like a gun, the lasers sound like wierd futuristic guns etc, etc. There isn't that many sound effects in the game at all really, but what is there does the job well enough. So yeah, the controls are a little dodgy here and there, jumping especially, and you can't shoot diagonal or while jumping, but to be honest there isn't any part of this game that is overly difficult. But I still lose lives and take hits all the time. The enemies appear in the exact same place every time, I know they're coming but they still manage to hit me now and again! And it's not like they're hard to kill or anything - see an enemy and just duck and shoot, they can't hit you while you're crouching. The main place I take hits though is the moving platforms. There are a couple of them throughout the game which will require you to either jump from platform to platform or jump whilst on the platform to avoid a projectile, and jumping from moving platforms is glitchy as hell. Sometimes you press jump and the game decides to throw you too far like you've done a super jump or something and other times it'll decide to just jump you straight up while the platform continues to move forward. The addition of a few more moves, mainly directional firing andthe ability to shoot while jumping would have made this game a lot better in my opinion! I personally don't think there is much replay value to this game. There is 3 difficulty settings, but all that happens on hard is the enemies are alittle faster and fire more frequently, they aren't really that much tougher to kill. Also, once you've completed it you'll have pretty much mastered every level, as you need all the Q cases and hostages to get maximum time to finish the last level. So unless you're a high score chaser you probably won't play this again after you've finished it. I've tried to be as honest as I can with my scoring of this game, but when you look at the scores it makes this appear to be a bad game. It's not, it's just not exceptional. This game is definitely worth a good playthrough and although it might cause some frustration in parts, stick with it and you'll have an enjoyable gaming experience!